This is from a full-page ad in The Kansas City Star of November 18, 2002. 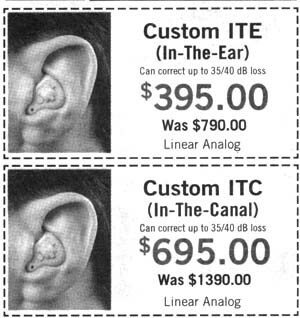 You'll find another ear-insertion error here. Several months later in a different ad in the same paper they finally realized they shouldn't imply it's a good idea to shove a dime in there too. But in this updated ad they still didn't get all of it right. Elsewhere in this full-page, full-color advertisement that presumably ran in quite a few newspapers nationwide, in case you can't read it, they say that the product "controls the loudest and softness of sounds." From a full-page ad in The Kansas City Star, December 5, 2005. 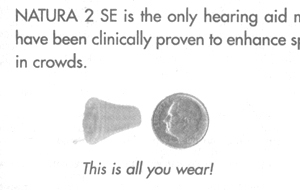 This hearing aid works in a most unusual way. A very tiny man wearing a lab coat listens to what someone says to you and then, using a step ladder perched on your shoulder, climbs into your ear and shouts it. Interestingly, the very tiny man uses the same hearing aid. Also, notice how they've handled the apparently trickier-than-I-thought word till. I've seen 'til and just plain old til -- both of which are also wrong -- but this is the first time I've seen 'till. 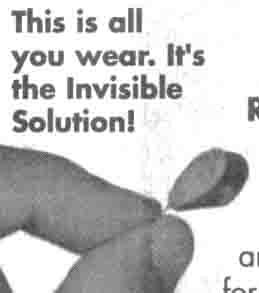 -- A small part of a large, full-color advertisement in The Kansas City Star of April 3, 2007. According to the nice woman I spoke to on the phone about this ad, the ITC model, below, is "quite a bit smaller" than the ITE model on top. Good thing they don't make eyeglasses. Also, why in the world would you use a slash instead of a hyphen? It's "35-40," not "35/40." I mean, the version with a slash could mean any of at least three things -- none of which is correct -- whereas the hyphen is instantly and obviously clear. Sheesh. But more important, second, what is meant by "Can correct up to 35/40 dB loss"? Does the 35 dB figure mean that sometimes they guarantee you won't get correction beyond 35? If that's the meaning, why not 36 dB or 34? What exactly does the 35 mean? For follow-up rants go here and here. -- From a full-page ad in the the November 29, 2010, edition of Parade Magazine. 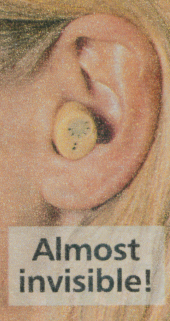 Also, this hearing aid -- although they're careful not to call it that -- costs $9.95.